To start, take a pink Brush Pen, twist it up and paint a curvy swirl outline down each side of the face, from the temples to the jawline. 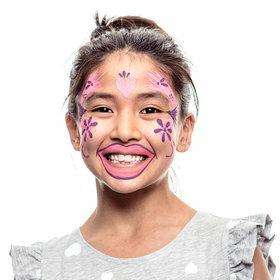 Fill in the swirl and then draw a lip-shaped ‘frame’ around the mouth. Finish by add a large heart to the forehead in the centre, just between the brows. Next, pick up the purple Brush Pen, twist it and start adding detail over the pink. 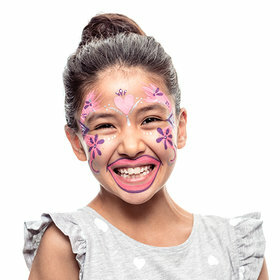 Begin by outlining the pink lips, and adding smile lines to each corner. Paint abstract flowers over the cheek swirls and add dots and sunray details to the heart, then create little fan shapes from the outer corner of each eye, making sure you don’t get too close. 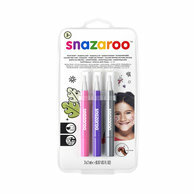 The finishing touches can be made with your silver Brush Pen, so add extra dots above and below each eye and details under the heart, at the top of the nose. Paint silver flecks on the eye fans and embellish the cheeks with a few curly swirls. Done!